Clayton Thorson fires a pass. The senior quarterback tallied a career-high 455 yards in Saturday's win. 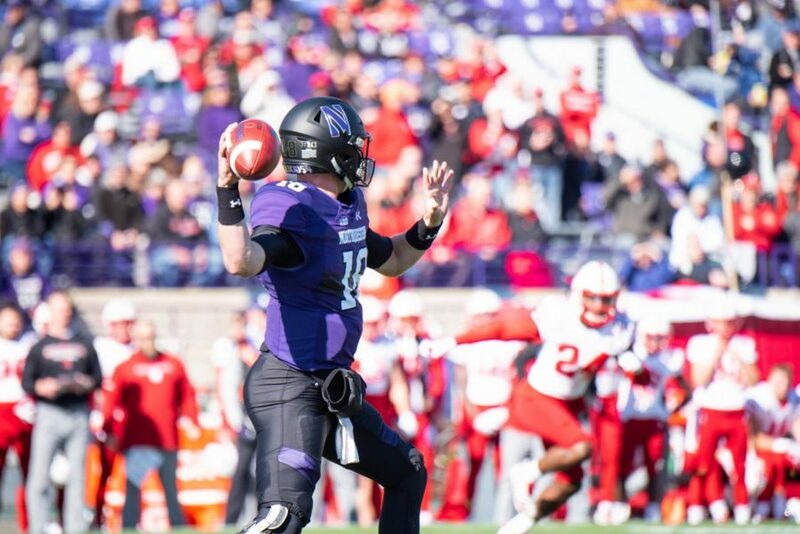 The idea of Clayton Thorson as an NFL quarterback seems more and more reasonable every week. The senior has always looked the part at 6-foot-4, 220 pounds, but he ranked last among qualifying Big Ten quarterbacks in passing efficiency in 2017 and was coming off an ACL tear in NU’s Music City Bowl victory. Those doubts, however, have mostly melted away over the last two weeks. Seven days after torching a top-25 team through the air, the senior quarterbacked a 14-point fourth quarter comeback, featuring a 99-yard drive in 1:50 to tie the game with 12 seconds left, as NU (3-3, 3-1 Big Ten) pulled out a 34-31 win over Nebraska (0-6, 0-4) in overtime Saturday. Whatever the Cats needed, Thorson provided it. Throw 64 times? He completed 41 of them for a career-high 455 yards. Need a do-or-die conversion on 4th and 10? How about two on the game-tying drive. Darts anywhere on the field? Just ask Flynn Nagel, who had a career-high 220 yards on 12 catches and caught two of Thorson’s three touchdowns. It wasn’t a perfect day for Thorson. He threw two interceptions, including one on a ball into traffic as NU was driving in the fourth quarter; that led to a Nebraska field goal that put the visitors up 31-21 with 5:41 to go. His 5-for-13 performance on the next drive was similarly imperfect, but two completions on fourth downs got the Cats into field goal range. Nagel also had the biggest catch on the 99-yard drive, reeling in a 32-yard grab on a wheel route to take NU across midfield. Thorson was 6-of-8 for 89 yards and the touchdown pass to JJ Jefferson on the game-tying drive. And he did it all with little help despite the Cornhuskers undoubtedly expecting NU to pass on almost every down. Running backs John Moten and Solomon Vault tallied only 39 yards on 19 carries. Last week, Thorson put up similarly large tallies, throwing for 373 yards on 47 attempts in a win over Michigan State. The past two games were in stark contrast to some of Thorson’s earlier performances, like sub-200 yard efforts against Duke and Michigan. By the time sophomore kicker Drew Luckenbaugh drilled a 37-yard field goal to clinch the overtime win for NU, Thorson had finished with career highs in completions, attempts and yards. It was a far cry from his freshman season, when the gunslinger leaned heavily on Jackson — and his own running ability.